I adore Katie McGarry’s contemporary novels and always look forward to the latest addition. I was particularly excited for Say You’ll Remember Me because it is a departure from both of her previous series. While I love all the books in the Pushing the Limits series, I am not a huge fan of the Thunder Road series (although I do love Walk the Edge). So while I was excited for Say You’ll Remember Me, I was also a little weary. However, I had nothing to be worried about! 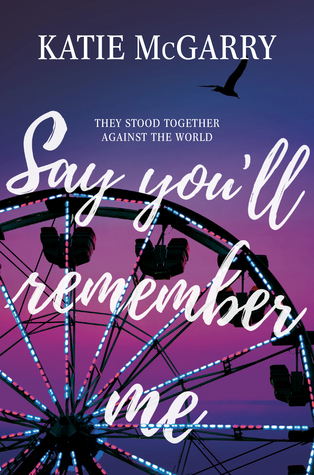 Say You’ll Remember Me reminded me so much of her first series, and I loved reading Drix and Elle’s story! The book begins with Drix returning home after taking part in the governor’s year long Second Chance program for a crime he did not commit. However, he took the fall because he believed his best friend did commit the crime. As a part of the plea deal he made, he now has to be the program’s spokesman. On the other hand, Elle is the governor’s daughter. She loves coding, but keeps this side of herself hidden from her parents, who expect her to be perfect. Her father is currently running for a spot on the Senate, which means Elle needs to act the part of the perfect, beautiful girl at his fundraisers and conferences. Drix and Elle first meet at a fair right before they both are to appear at one of the governor’s conferences. After playing a carnival game together, Drix steps in to help Elle when he sees her being harassed by two college frat boys. From there, their forbidden romance begins. Since Drix is one of the participants in her father’s program, they are not allowed to date or even be seen together in public. However, that doesn’t stop them from forming a friendship. I love how their relationship develops and how it takes a long time for them to actually jump, even though they are attracted to each other from the start. One of the reasons I love Katie McGarry novels so much is because of how complex the main characters are and the different themes and topics she weaves into her stories. I felt so much for Elle and Drix as they battled their personal demons. Elle’s relationship with her parents tore me apart because while I could see the love they have for her, I was conflicted by how miserable they were making her by using her for the election campaign. Drix’s inner struggle of trying to figure out who he is and battling the person he used to be. One theme that Katie continually weaves in her stories is how you can form your own families, which is seen with Drix’s family in Say You’ll Remember Me. Okay, so mild spoiler ahead but WARNING (highlight to view): a dog traumatically dies at the end after being saved from almost being drowned by his owner in the beginning of the story. Overall, I really enjoyed Say You’ll Remember Me, and I am so glad that Katie has returned to storylines like the ones from the Pushing the Limits series. I highly recommend Katie McGarry’s novels for fans of contemporary romance that are looking for swoon-worthy reads that deal with darker subjects. It’s not too late to preorder & receive an exclusive story! Oh nice! I didn’t like the other series either. And thanks for that spoiler warning! No problem, Karen! Thanks for reading! No problem! Glad to have been a part of the tour! Love your review! I can’t wait to read this! Thanks, Darque! Hopefully you’ll read it soon! Have you read any of Katie’s other books?? I have not, but I’ve read lots of positive reviews on this one!